The symposium was held November 10, 2014 at Stanford University and co-hosted by UC-San Francisco and UC-Berkeley. Simon Donaldson, permanent member of the Simons Center for Geometry and Physics, has won one of the inaugural Breakthrough Prizes in Mathematics. This $3 million prize was launched by Mark Zuckerberg and Yuri Milner, and it aims to recognize major advances in the field, and communicate the excitement of mathematics to the general public. This is a fitting tribute to Simon, one that he richly deserves. He has been responsible for numerous breakthroughs in mathematics. Some have created new fields of study, while others have re-invigorated existing fields with revolutionary insights. His influence on geometry and topology over the last 30 years is unsurpassed. 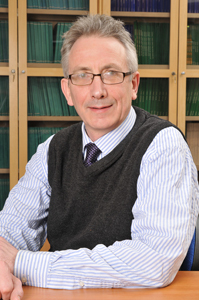 Simon’s first major breakthrough came in 1982 when he was a graduate student at Oxford. He realized that one could use the moduli space of solutions to the Yang-Mills equations for a bundle over a 4-dimensional manifold to produce invariants of the 4-manifold. This insight revolutionized the study of 4-dimensional manifolds. From this beginning, a new field of study, ‘Donaldson theory,’ came into being and continues today to be one of the most active fields of research in both mathematics and physics. Simon’s most recent breakthrough happened within the last two years. Together with Xiu Xiong Chen and Sun Song, both of Stony Brook University, he proved what has been referred to as the ‘Donaldson-Tian-Yau Conjecture’. This conjecture, and now theorem, posits that a Kahler-Einstein metric exists on a given smooth algebraic variety with positive first Chern class (the Fano case) if and only if the variety satisfies an algebro-geometric condition of stability. This problem has antecedents in Donaldson’s 1983 Ph.D thesis where he established a similar result for Hermitian-Einstein metrics on rank two bundles over algebraic surfaces — the metric exists if and only if the bundle is stable in an appropriate algebro-geometric sense. This result was generalized to other dimensions by Uhlenbeck and Yau, inspiring Yau to suggest that the existence of Kahler-Einstein metrics is related to stability. The idea was sharpened by Tian into a more concrete conjecture and refined later by Donaldson into its present form, proved by Donaldson and company. These are two of the most influential of Simon’s breakthroughs. In between these, there have been important advances in the study of 3-dimensional algebraic varieties in the form of the Donaldson-Thomas invariants, in symplectic geometry with Donaldson pencils, and in Floer homology, which is used to study 3-dimensional manifolds. Each of these works has created a whole field of study that continues to be very active. Additional information on the Breakthrough Prizes is available at breakthroughprize.org.